Market Day, Market Square .South, Lisburn, watercolour by W. 1. Boyle, 1885. (Courtesy of the Lisburn Museum). PUBLISHED WITH THE AID OF SPONSORSHIP FROM COCA-COLA BOTTLERS (ULSTER) LTD. The intervening two years since Volume 5 of this Journal was published have passed with alarming speed. 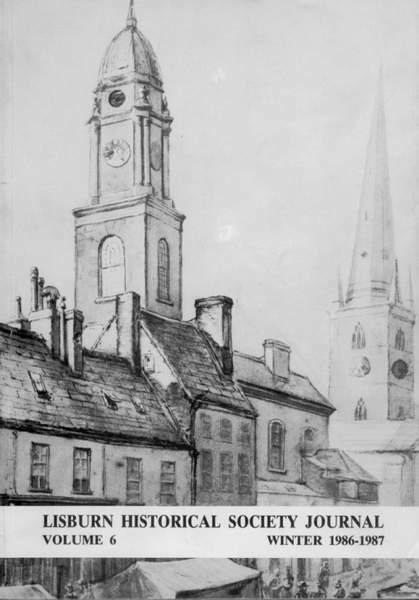 1985, which was designated Huguenot Heritage Year, saw a series of events in Lisburn acknowledging aspects of the Huguenots' contribution to Irish life. There was a memorable service at the end of September in Lisburn Cathedral, when the preacher was the Archbishop of Armagh, the Most Reverend Dr. J. W. Armstrong. Following this, there was a most successful exhibition in the Lisburn Museum, which ran to April 1986, bringing to our notice many themes of Huguenot activities in this area. Lisburn was the only Northern colony of the Huguenots in Ireland, and the Society has among its members descendants of that colony. The three lectures to Christmas 1985 were on the Huguenot theme. In the context of the Huguenot Commemoration, I would like to acknowledge the Very Reverend W.N.C. Barr, Dean of Connor, whose gentle persuasion prompted what was a memorable celebration of Lisburn's part in an important period of European history. In the same period, two forgotten Lisburn men were remembered-Robert Lindsay Crawford, a man of the people and John Balance, who was to become Prime Minister of New Zealand. Miss H. Frey, in an important two-lecture series, took the Society through two centuries of change in the farming community, whose significance to this area is fundamental to its continued prosperity. Mr. S. J. O'Sullivan, since he volunteered to act as Outings Secretary, has opened new vistas and doors which have proved not only interesting but memorable, and we look forward to next season. The 1986 Annual General Meeting was not able to elect a successor to Sharon Adams who retired and whose period of Secretary has been exemplary. The Society is in her debt and we will miss her quiet efficiency in this important post. This, the Society's sixth Journal, covers a wide period of the area's history and in doing so, I hope, gives a new enlightment to that history. I should like to thank all those who contributed to the making of this journal, but especially the authors, whom I chased, bullied and badgered into producing copy for it. This is the first occasion on which I have acted as Editor. It has been a demanding and time-consuming-but interesting-experience! Journals like this depend, to a large extent, on the good will of others. In this publication, professionals specializing in their own fields and local historians working in an amateur capacity, have come together in what is, in my opinion, a happy marriage of expertise and local historical knowledge. It is hoped that the reader will concur with these sentiments, and derive as much pleasure from the contents as I do.